Kazura Bridge (Kazurabashi Bridge), Tokushima is not the most stable looking bridges around. However, back in ancient Japan, bridges constructed out of vines and wooden planks were the only way to get across valleys. 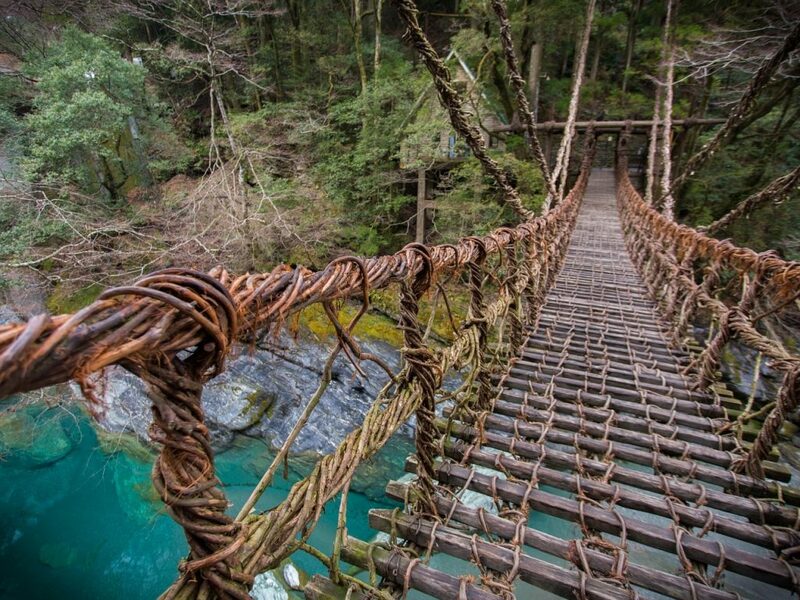 The bridge is located in the Iya Valley of Tokushima Prefecture, and stretches 45m (147ft) across the Iya river. Originally, there were 13 of these bridges built along the Iya valley, but as time withered away the vines and wood, all but 3 cease to exist. The Kazurabashi Bridge is the longest of the 3 remaining bridge, and can only be walked across from one direction. The bridges are believed to be around 1,000 years old (give or take a few hundred years) as construction documents of these bridges contradict each other. They were either used for Kobo Daishi’s pilgrimage routes, or they were built by Heike refugees during the Gempi War (1180-1185). Either way, these bridges have a significant amount of history behind them, and would be worth checking them out.